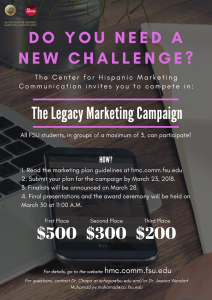 Tallahassee, Fla. — The Center for Hispanic Marketing Communication is having a competition during the month of March open to the all Florida State University students. The Legacy Marketing Campaign, sponsored by State Farm and Emerson, is a competition for groups to create a digital marketing communication campaign for the Center. The winners will receive a cash prize. 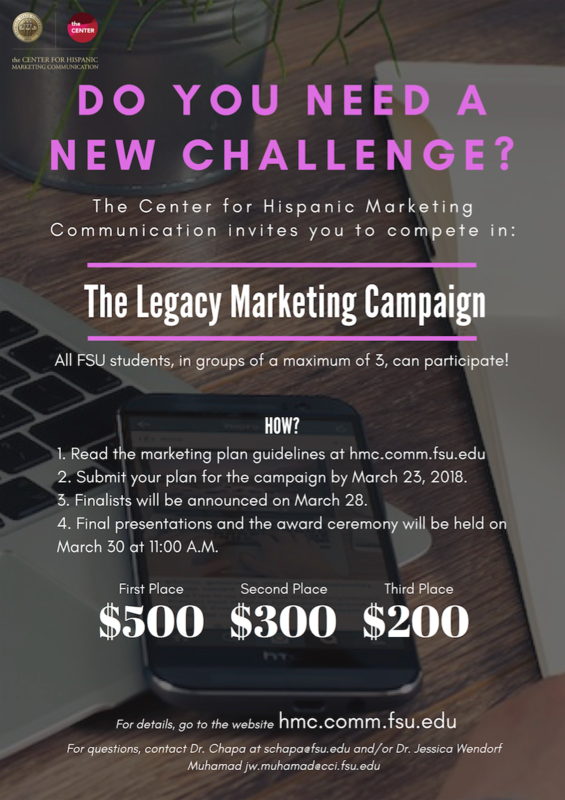 In an effort to support the ongoing educational and outreach efforts of the Center for Hispanic Marketing Communication at Florida State University, the Legacy campaign aims to develop tools and strategy for fundraising from Center supporters such as individuals and corporations and previous and current students for the establishment of an endowment. The endowment is named after Dr. Felipe Korzenny, founder of the Center. The submission deadline for the Legacy Marketing Campaign is March 23rd at 11:59 PM. Finalists will be notified on March 28th. All finalists must present and pitch their campaign on Friday March 30th at 11:00 AM at the School of Communication. First place winners will receive a prize of $500, second place will receive $300, and third place will receive $200. Later this month, the Center will be hosting a fundraiser at Tijuana Flats, 2020 W Pensacola St #230A, Tallahassee, FL 32304 on March 19th and 26th. More details will be shared at a later date on the Center’s Facebook page. Make sure to follow the Center’s Facebook page to stay up to date on all future events. Posted in Student Activities, Uncategorized.